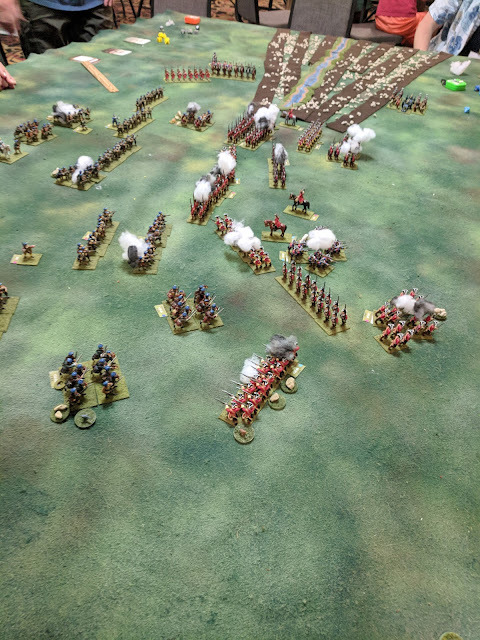 .. Fog of War .. 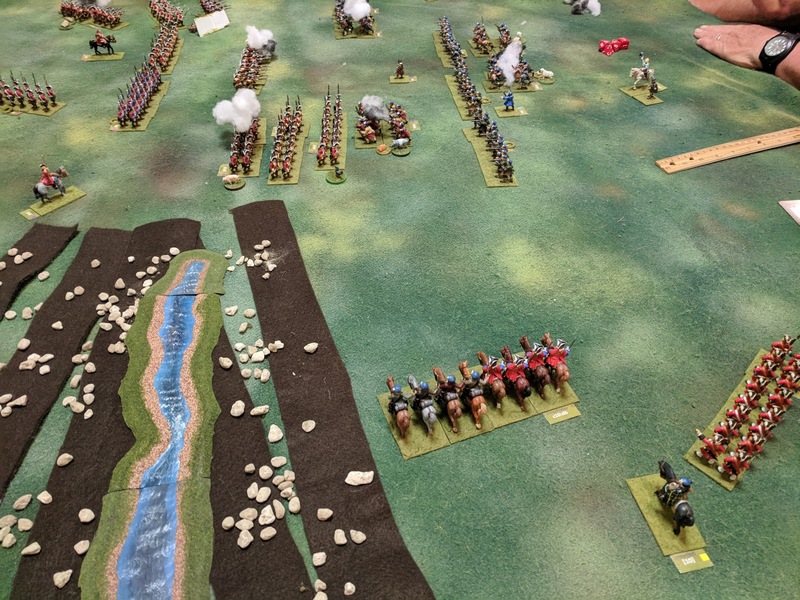 In "Fight for a Throne, (p231ff), Duffy gives fascinating details and map showing the troops, and alternatives available, to the Jacobite and Hanoverian forces should the “Highland” army move to take London. The most likely routes were an easterly route through Waltham Cross/Tottenham Cross, and a westerly one down Watling Street - the Roman road through Edgware & Kilburn. 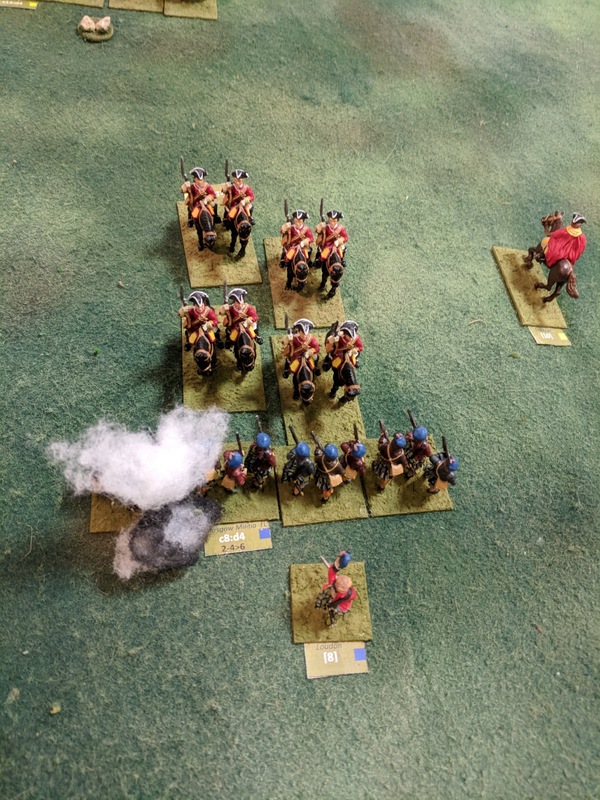 The Hanoverian forces were encamped at Finchley to be able to react to either avenue of attack, and King George himself was ready to lead his army. Most of the Jacobite force are with Charles Stuart, who has taken the westerly route, and have reached Kilburn - only a few miles from a panicking City of London. The King has drawn up his forces there in a good defensive line, with flanks well-protected by dense forest. 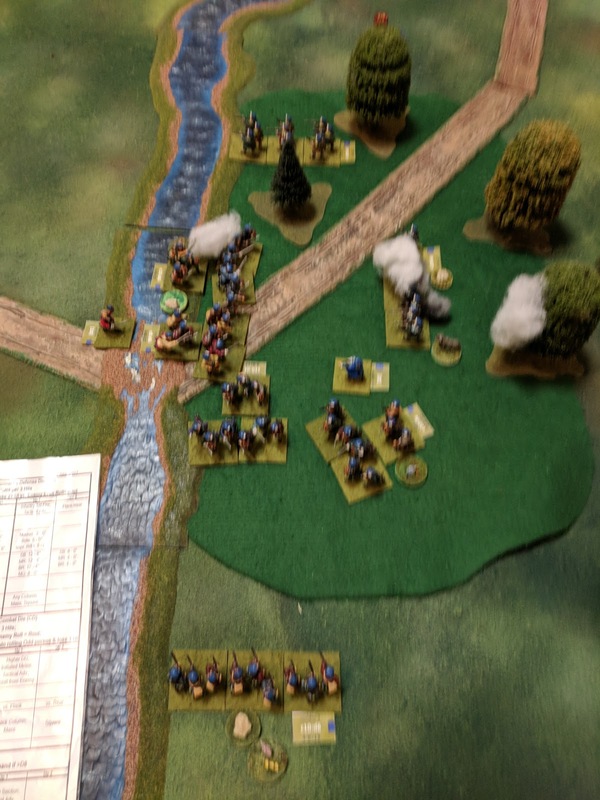 He must defeat this invading force, and then hurry across to support the militia defending the eastern route against a smaller lowland force. The clock is ticking for both armies …. 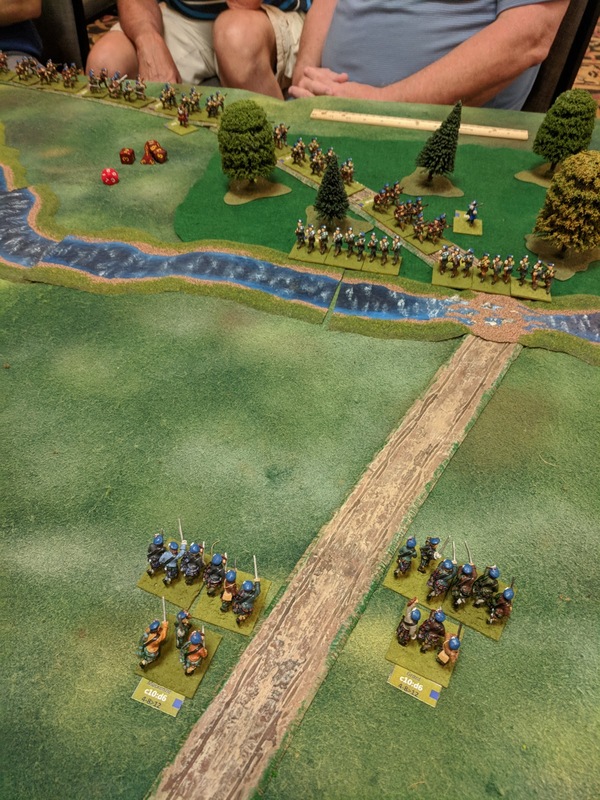 will the King be able to defeat the Jacobites in time to halt the eastern threat? 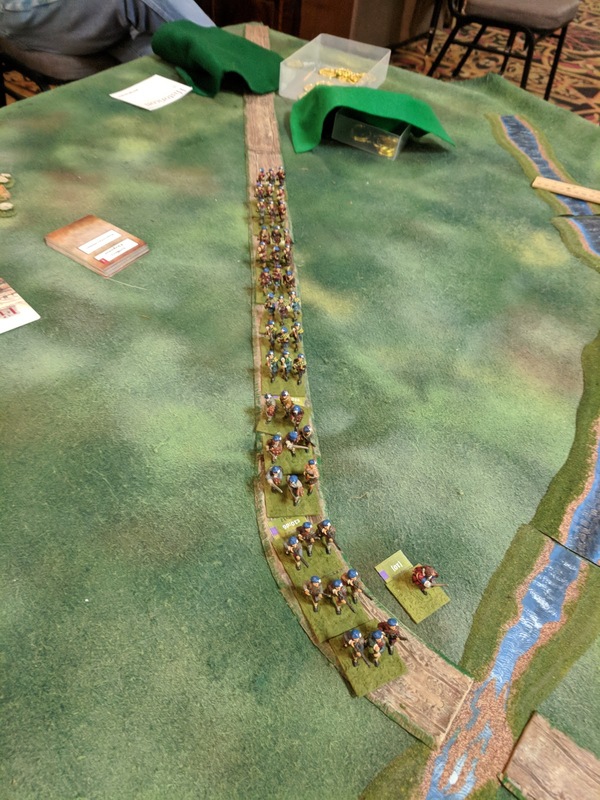 Will Charles Stuart be able to defeat the King, and avoid being caught by the Cumberland’s pursuing, but lumbering, army? 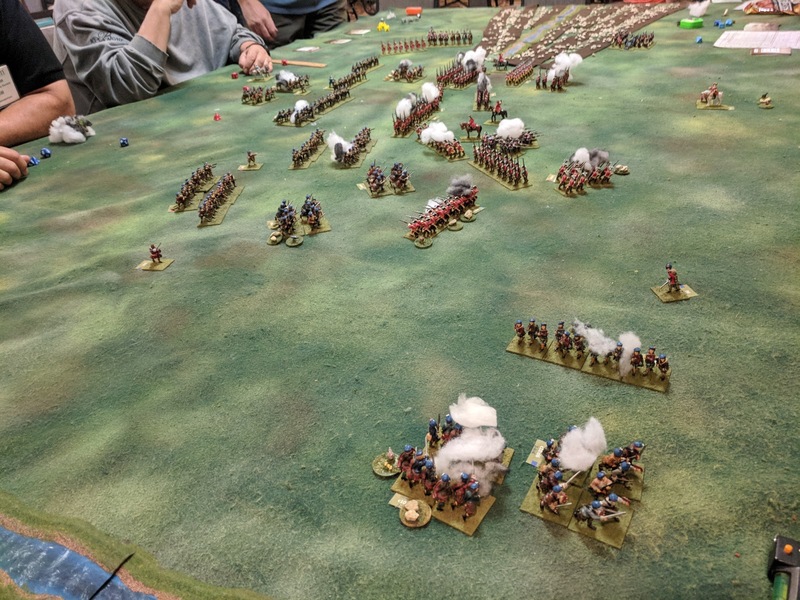 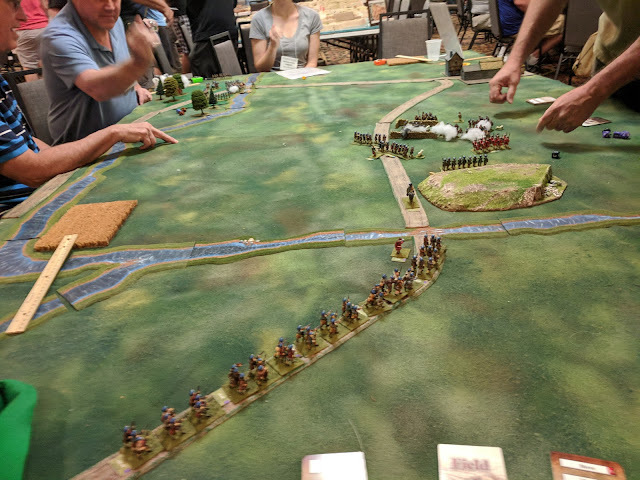 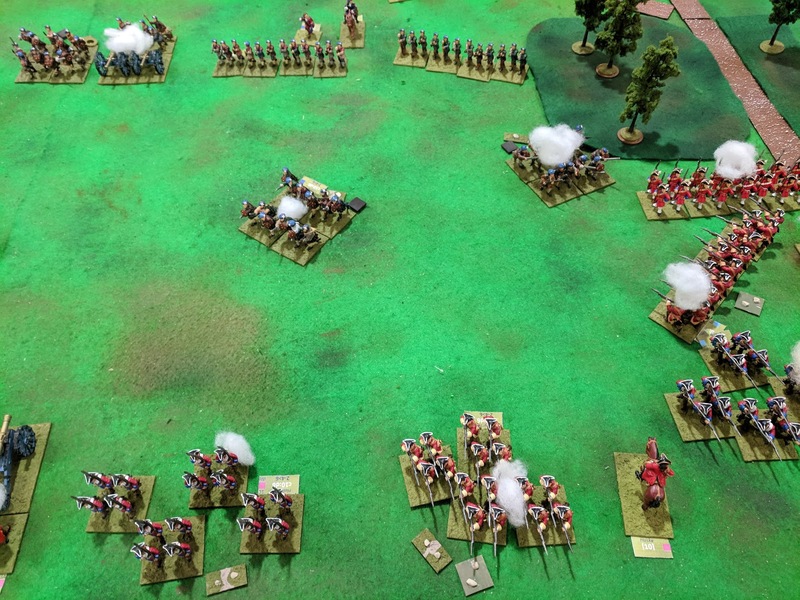 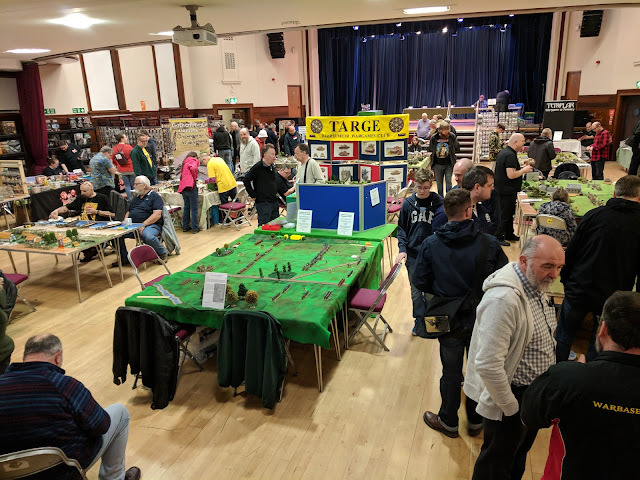 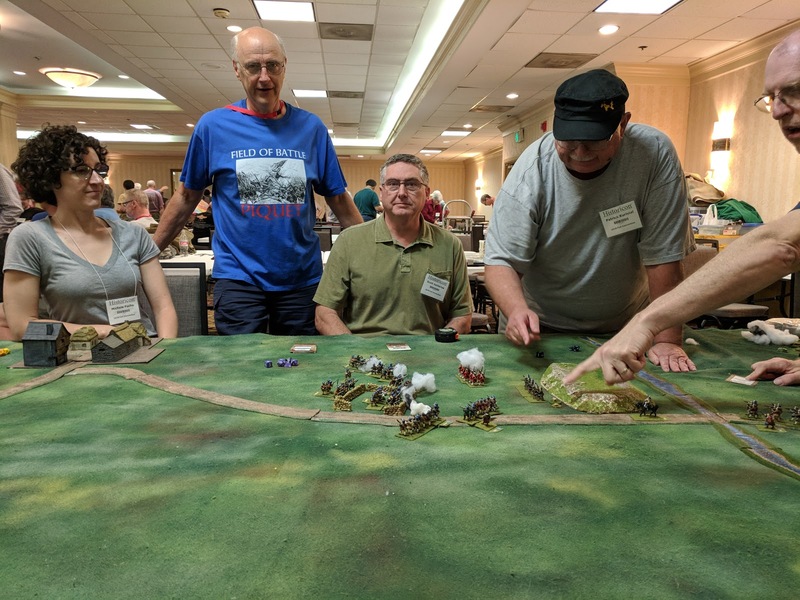 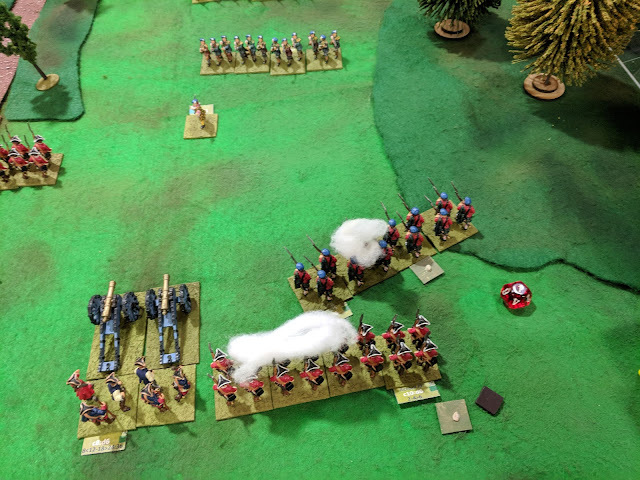 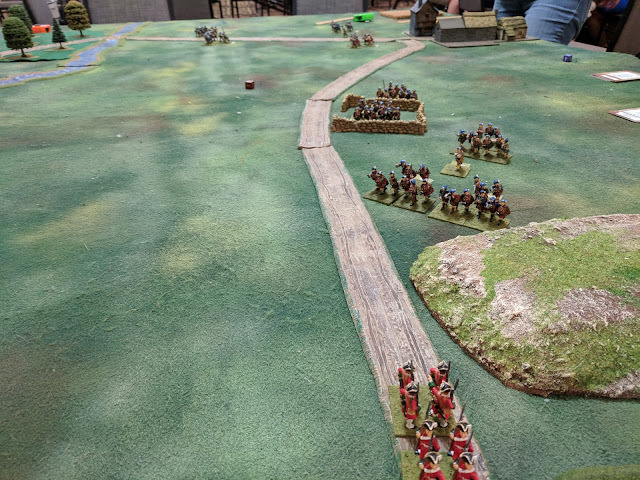 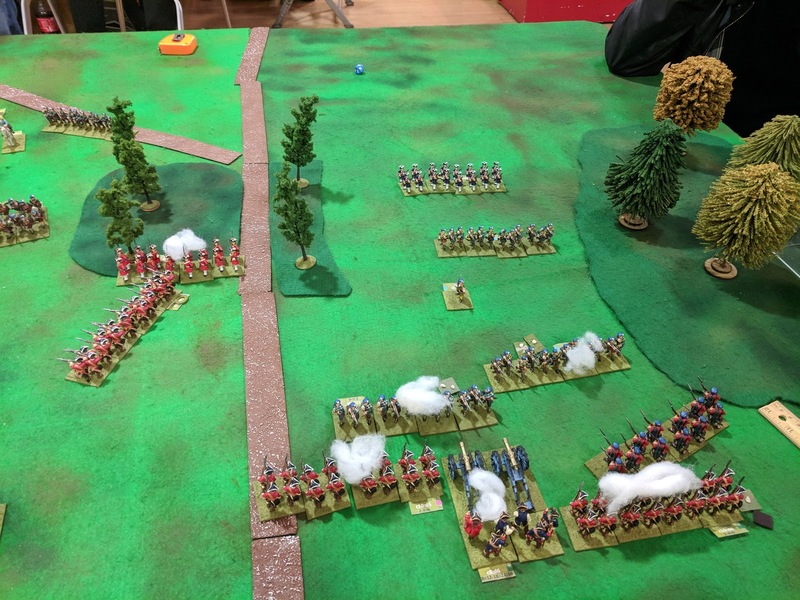 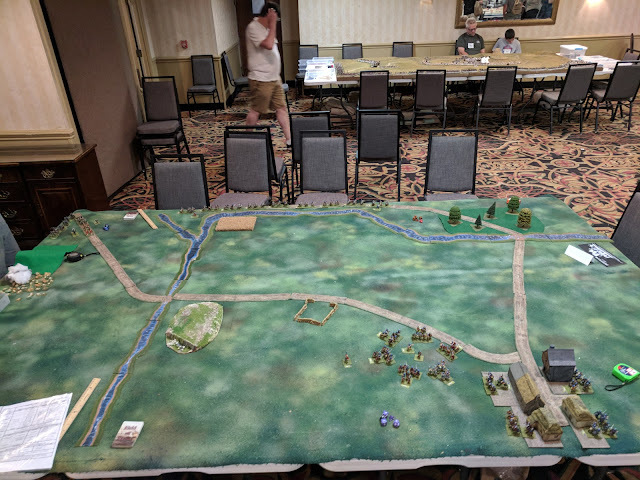 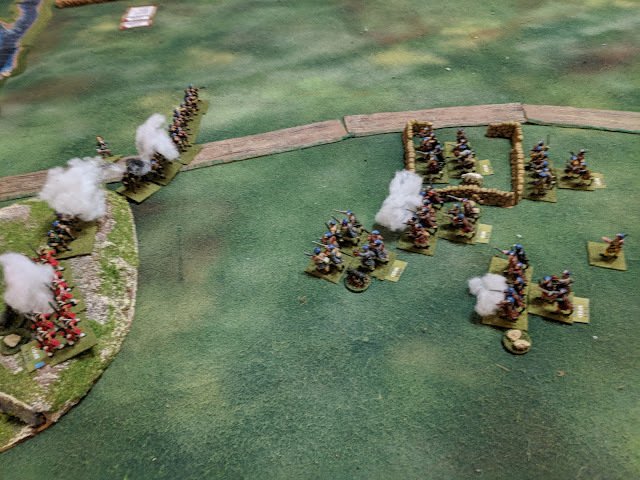 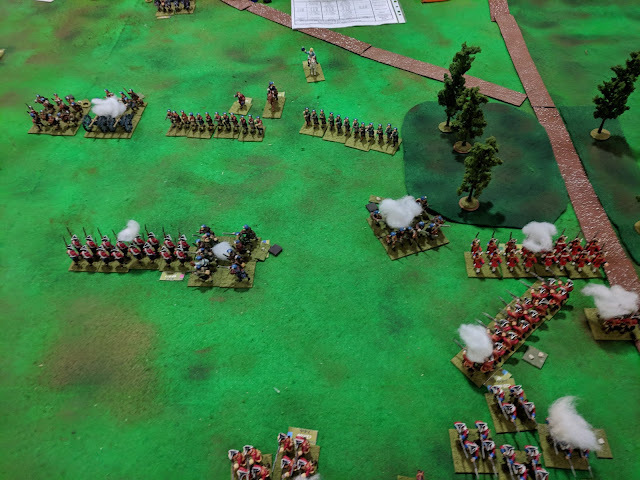 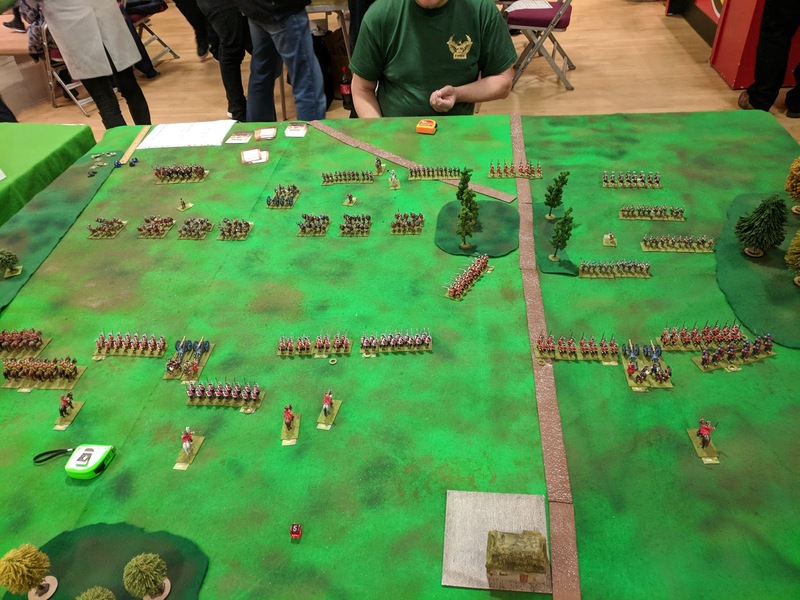 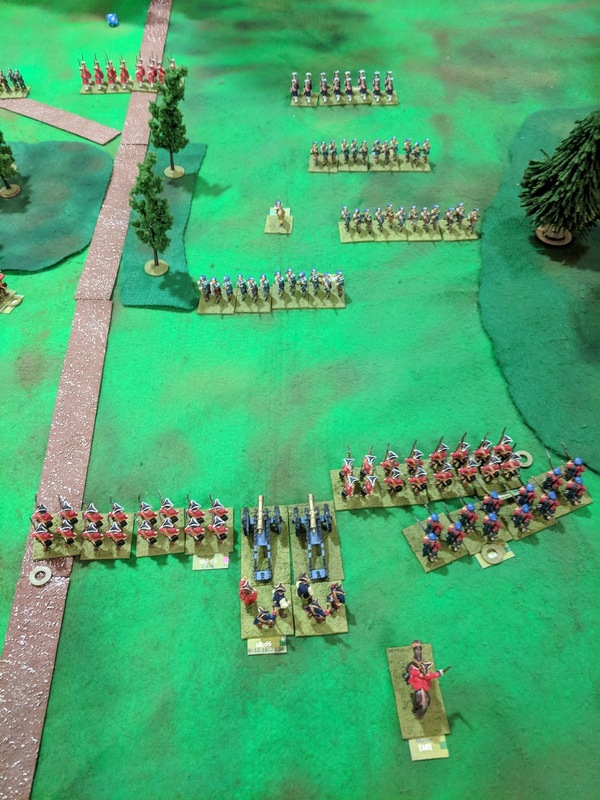 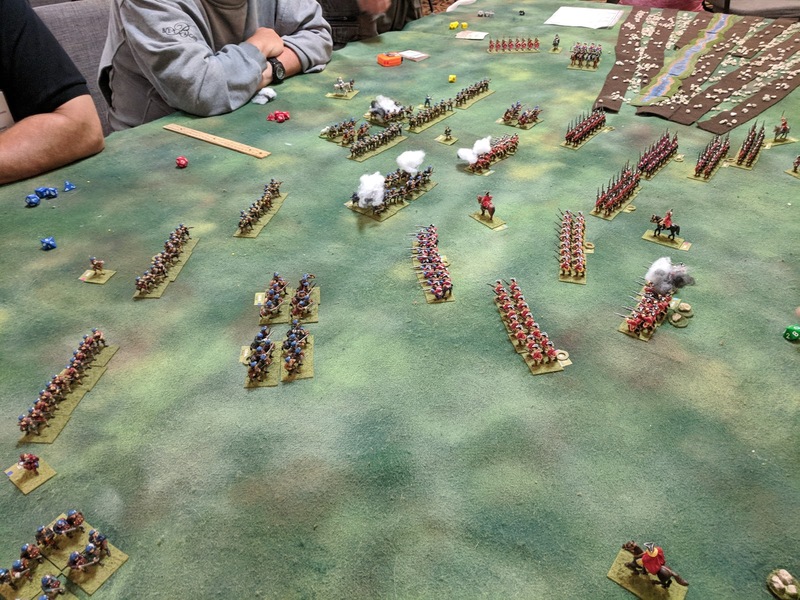 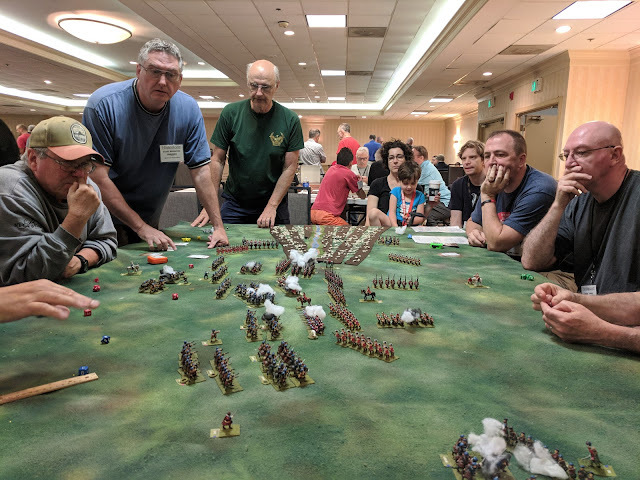 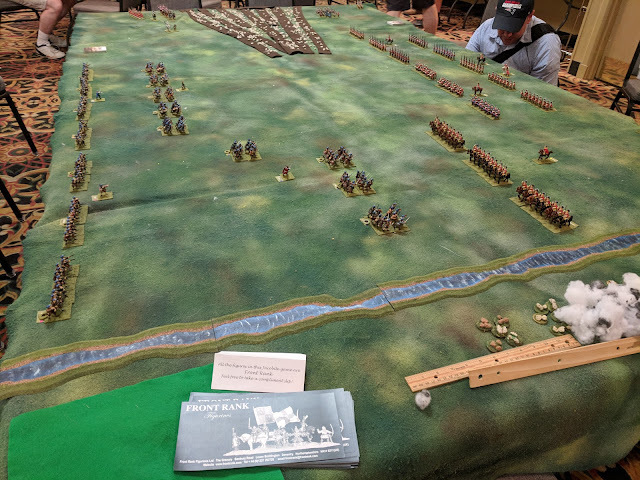 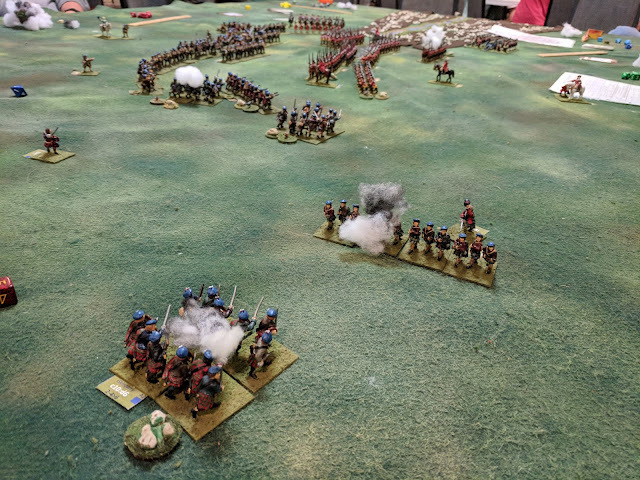 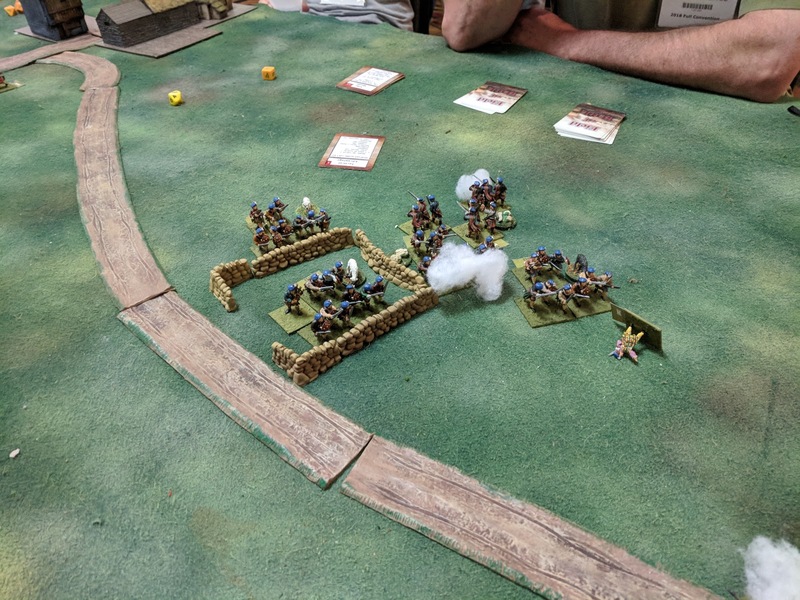 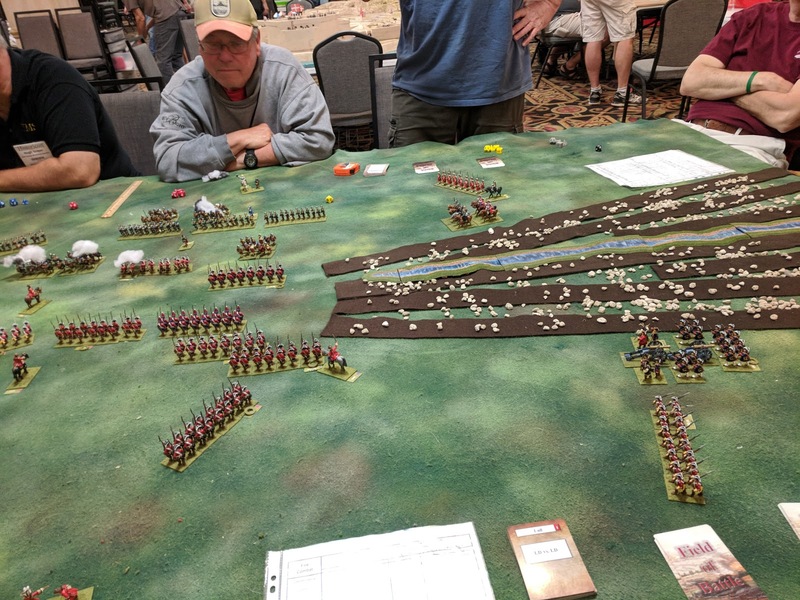 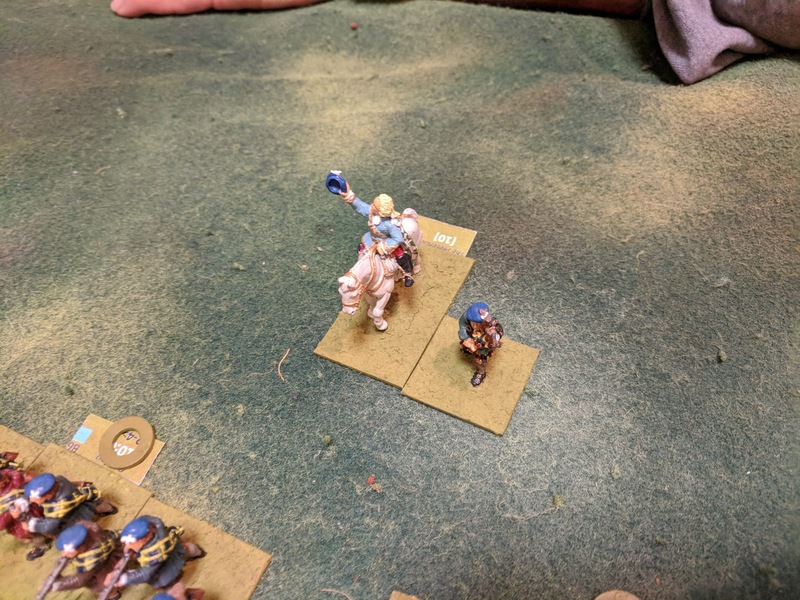 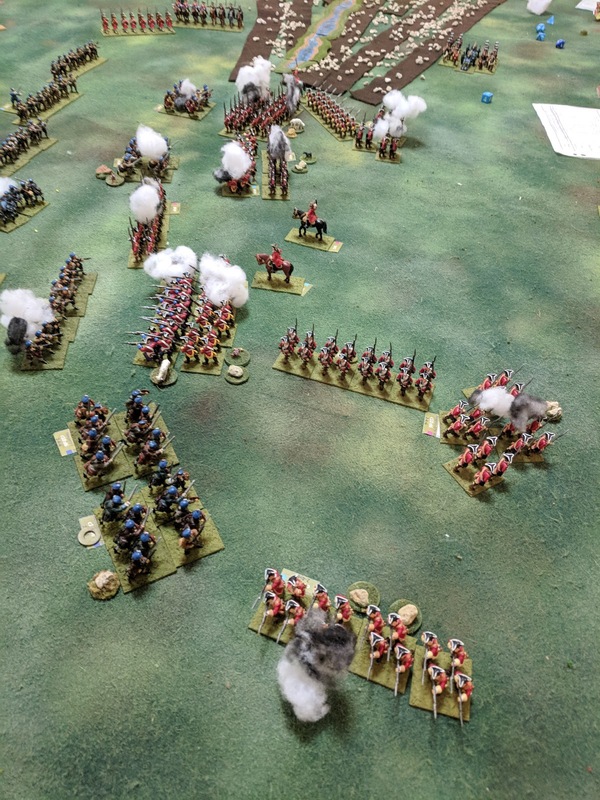 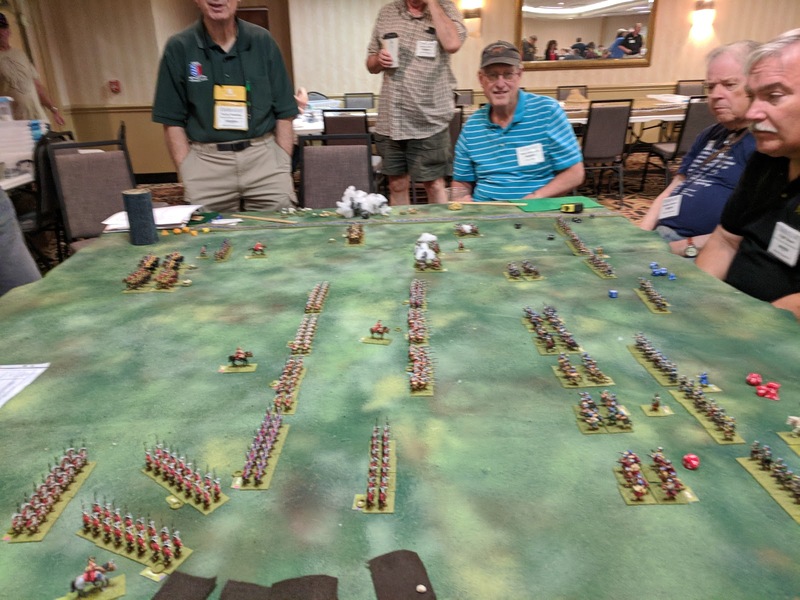 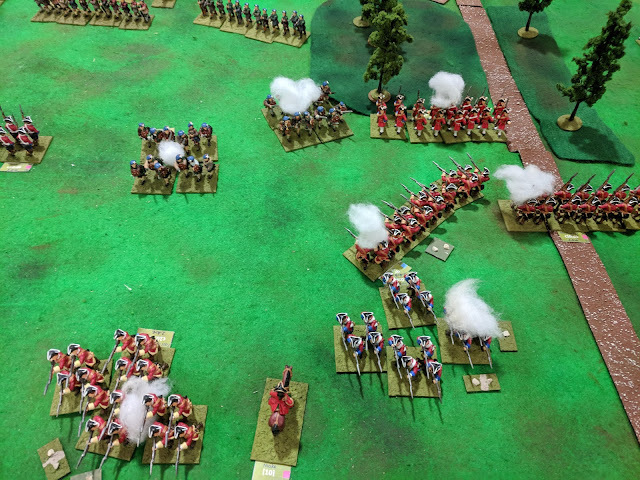 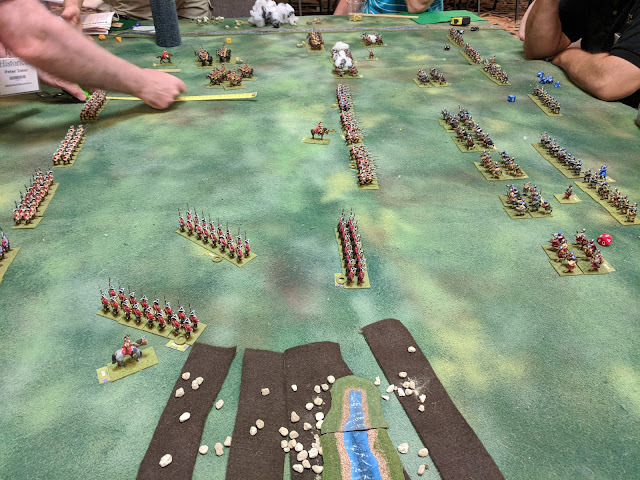 The game was presented at Skelp in Forfar on 14 October 2018, as the game presented by the Falkirk and District Wargames Club. 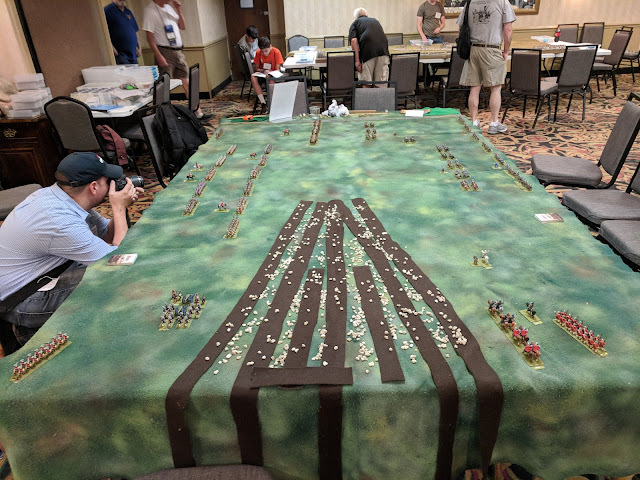 I used my figures (mostly Front Rank) and terrain, and, for rules, Piquet Field of Battle 2. 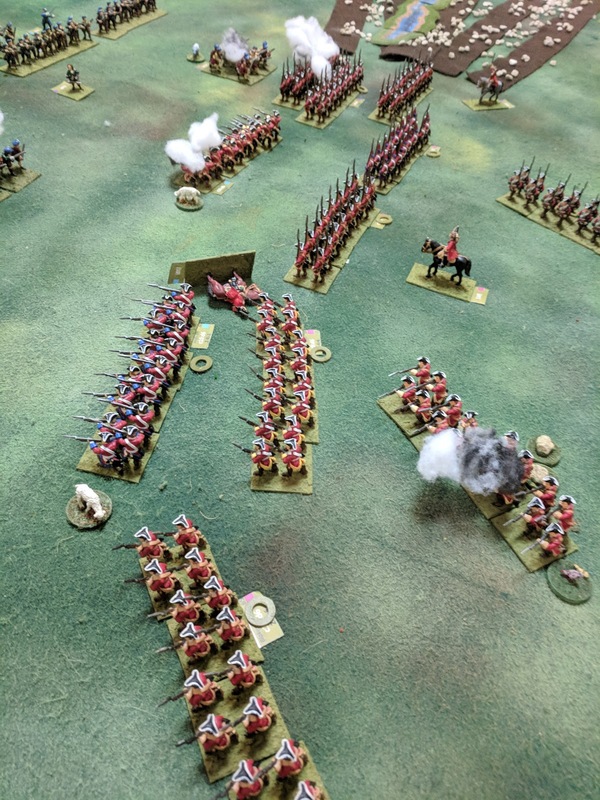 Described here was the first of two occasions when it was gamed, with David Knight taking charge of the troops under Charles Edward, and John Ewing and myself each taking commands of King George II. The Jacobite left wing attack did not fare so well .. as shown by the absence of their troops in the proximity of the guns there ..
.. with great success, now leaving the artillery exposed ..
but it was all rather academic with that loss in the centre, and shortly afterwards the Hanoverians left the field, having failed a Major Morale test. 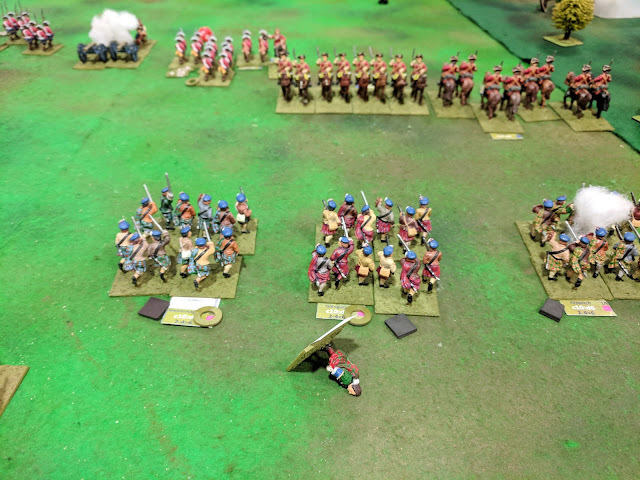 The second game had 2 players a side, and turned out to be a different, but equally convincing win for the Jacobites - the Highlanders on the right wing this time causing most of the damage. 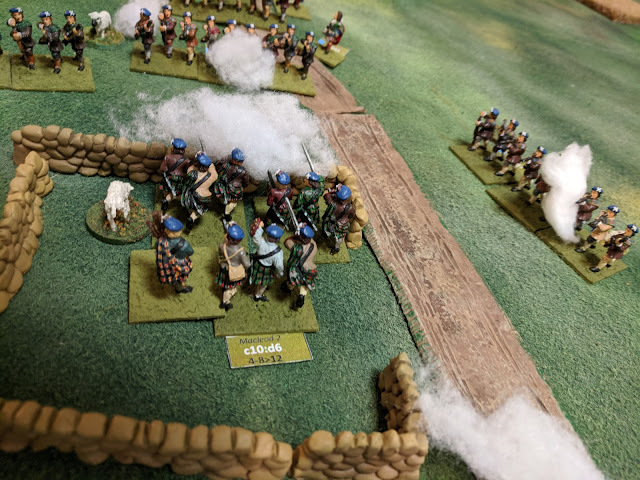 However, in his attempt to get the Highlanders in the centre moving, Charles Edward Stuart was mortally wounded, but the damage had been done to the Government forces. 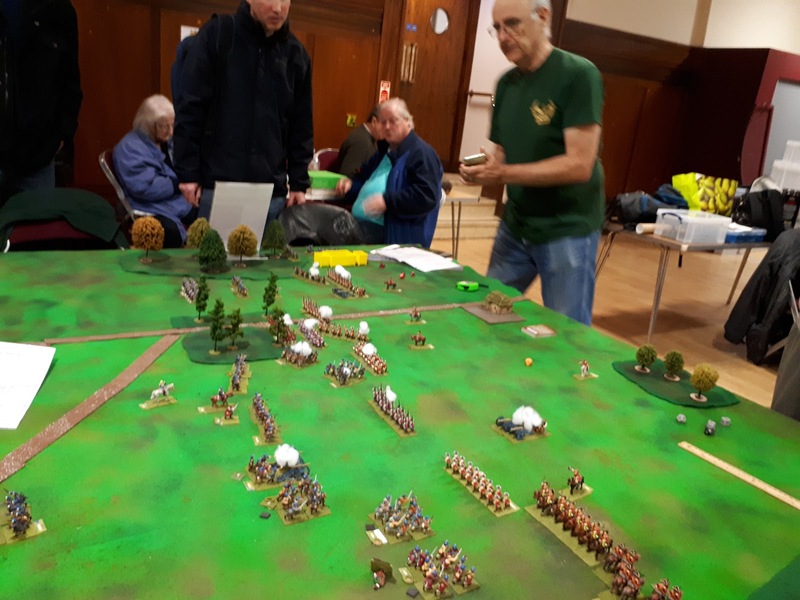 The players and spectators then engaged in an wide and interesting discussion about what now happens as Charles Stuart is dead ..would the Jacobites troops would go home? 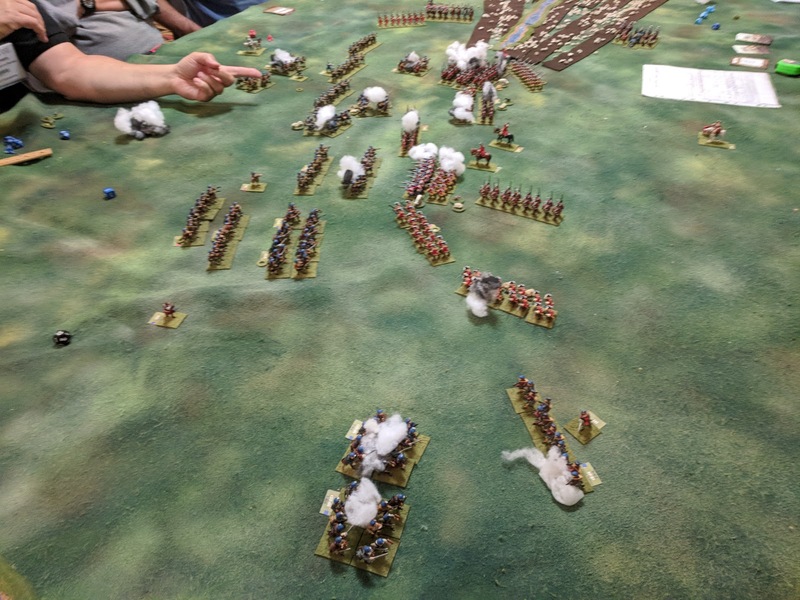 ... or just loot London first .. and then go home? 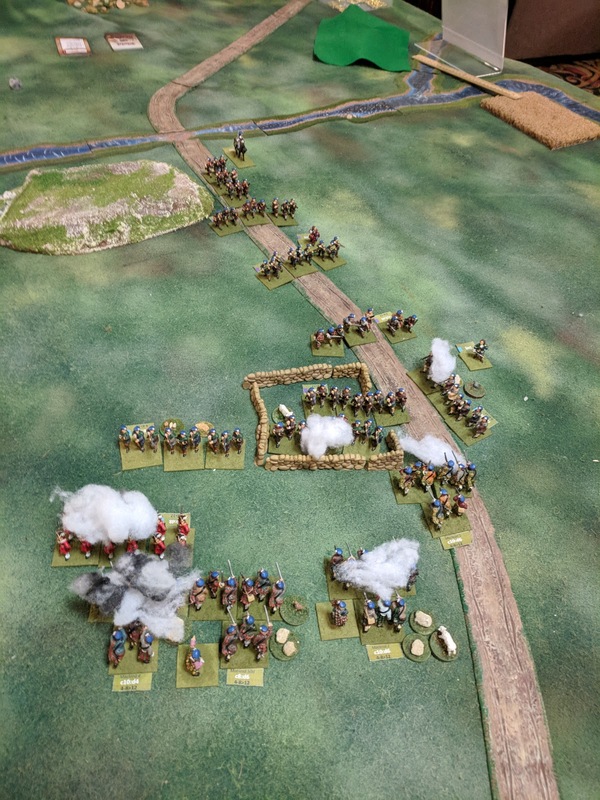 The Pretender is leading Jacobite Cavalry and Irish Piquets onto the field beside a deep and difficult ravine. 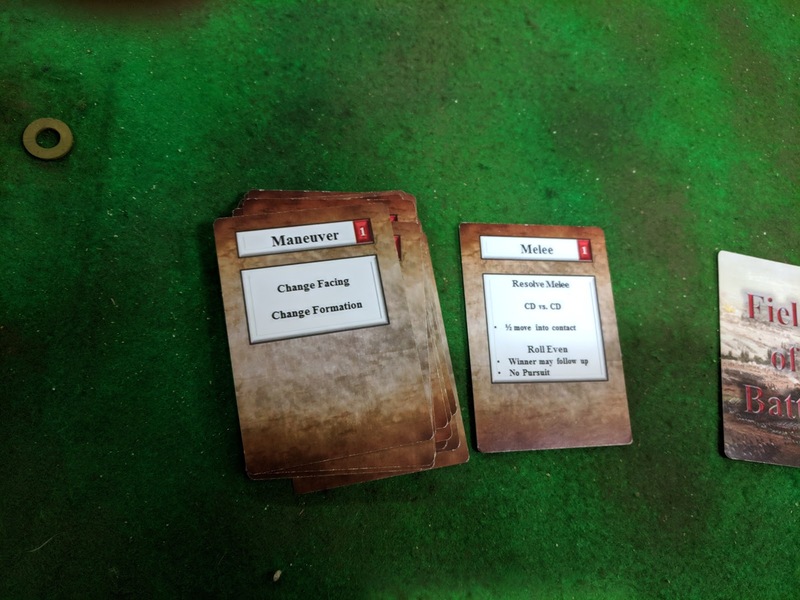 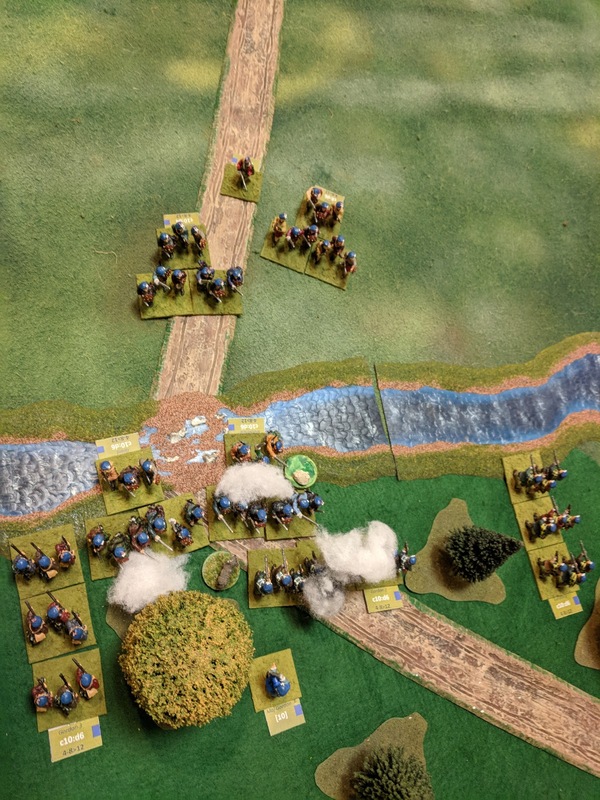 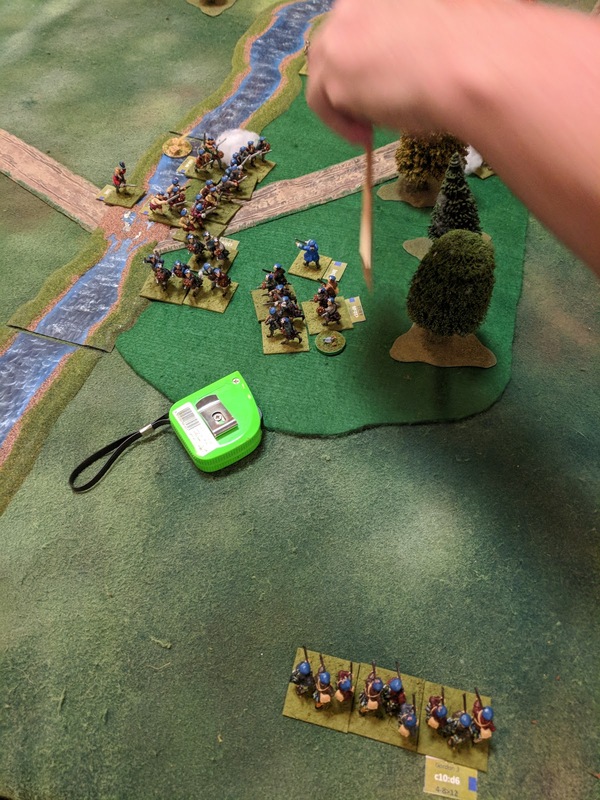 The Hanoverians are first to take the initiative and get a Move card, which the cavalry successfully uses to charge the approaching highlanders .. 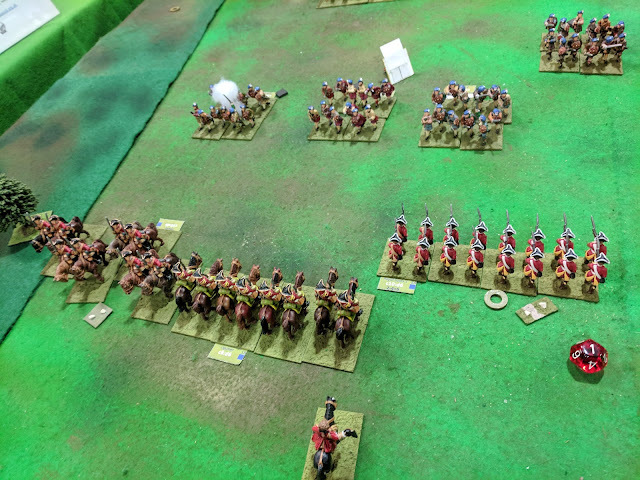 Meanwhile, the Hanoverian cavalry commander is found to be a casualty of the abortive charge, leaving the Hanoverian left flank exposed except for the unit of Glasgow Militia, (whose commander, I suppose, could be renamed Joshua McChamberlain) ..
More combat in the centre as the Hanoverian left wing starts to feel the pressure .. and the un-mired guns fail to move on the next 3 Move cards!! 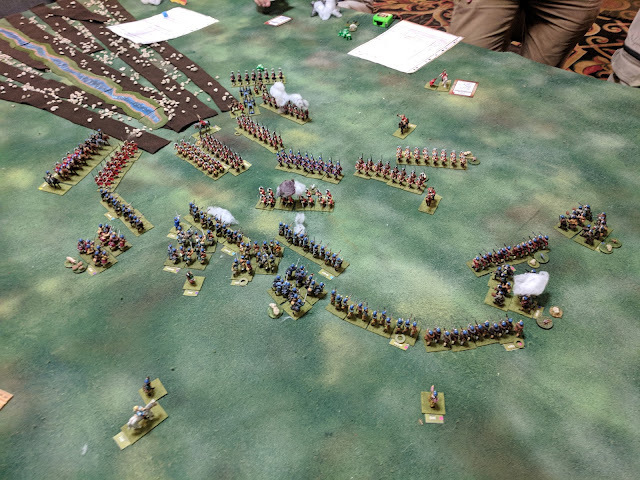 The Jacobites draw an "Uncontrolled Charge" card, mandating all Highlanders to move 8" and if possible go into melee ..
and the Hanoverians soon failed an Army Morale Test, so leaving the Jacobites victorious. The key port of Aberdeen was in Jacobite hands, Duncan Forbes of Culloden and Lord Loudon gathered a small force of Hanoverian highlanders, led by the Skye chief, Macleod of Macleod, with Munros, Grants & Mackenzies. 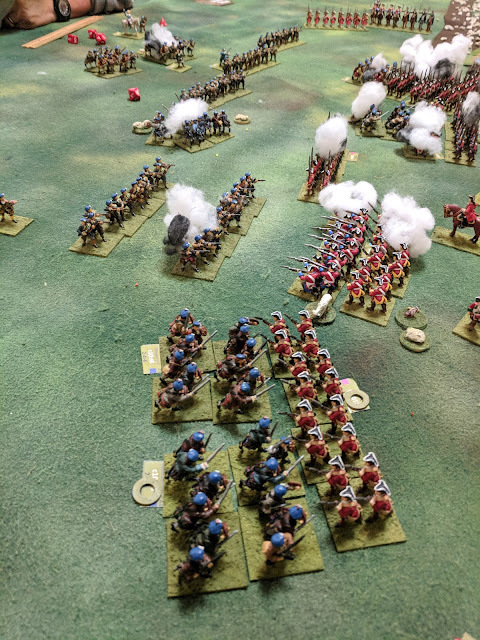 These forces converged at the royal burgh of Inverurie, on the main road to Aberdeen, only to be surprised late in the day by Lord Lewis Gordon, with a mixture of troops - his own regiment, impressed men, and some recently-landed French regulars - Irish Piquets. 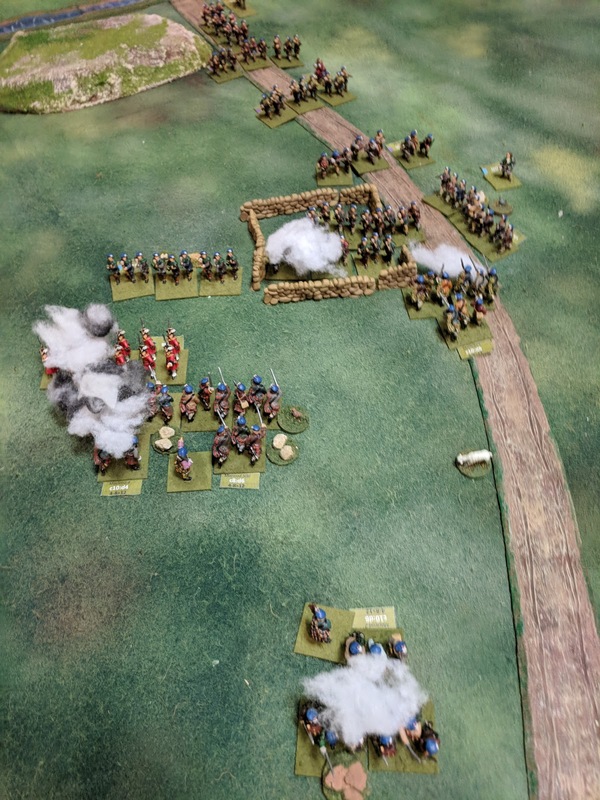 The second of our three 1745 Jacobite battles - between Hanoverian Highlanders and Jacobite Lowlanders!. 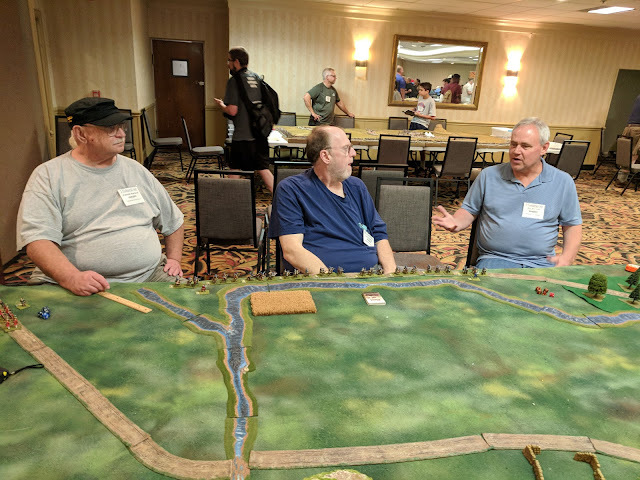 The Jacobite gamers: Patrick, Erik and Jim. 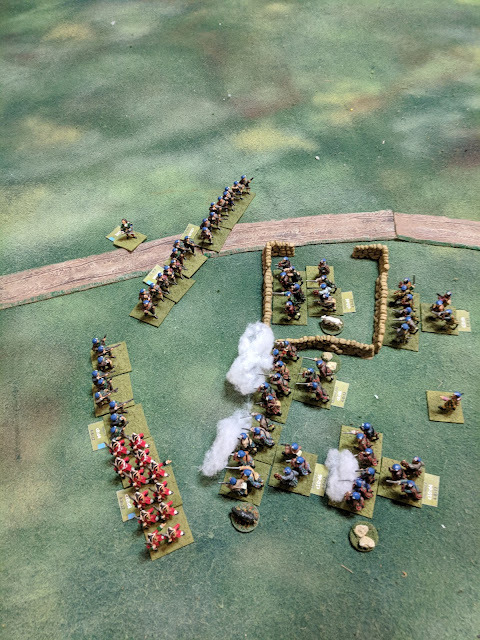 and engage the Gordons, some of whom were still in march column ..
and have 2 units attacking one such column in the rear and flank ..
and the following Inverurie force .. er .. fails to move. 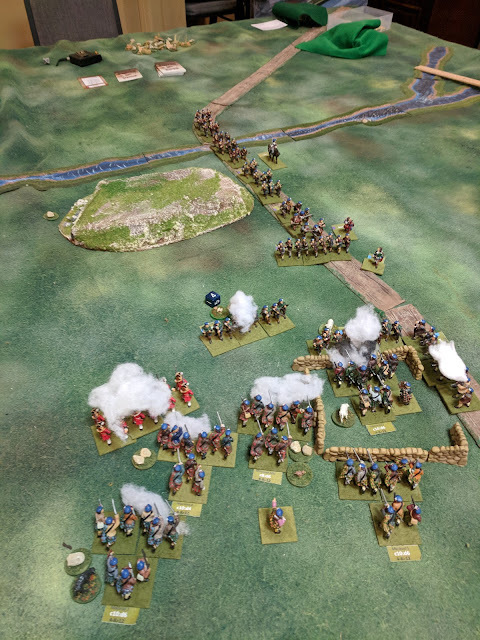 Clearly the "impressment" of these forces is causing them to drag their feet ..
but another Move card for the Highlanders .. and still no movement ffrom the Inverurians. 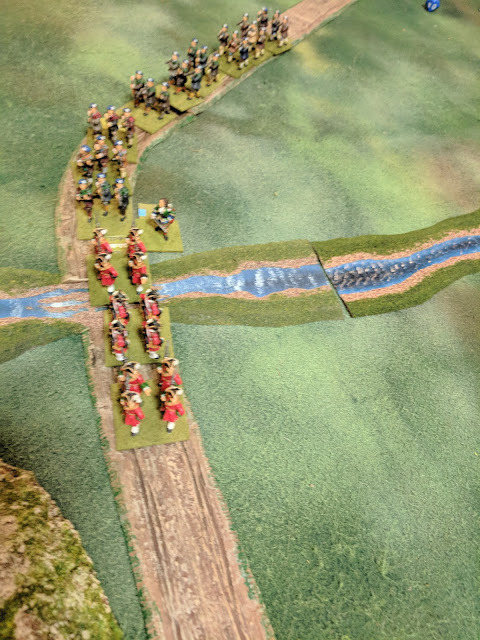 Now the Inverurie militia actually get across the ford, but still not near the action. 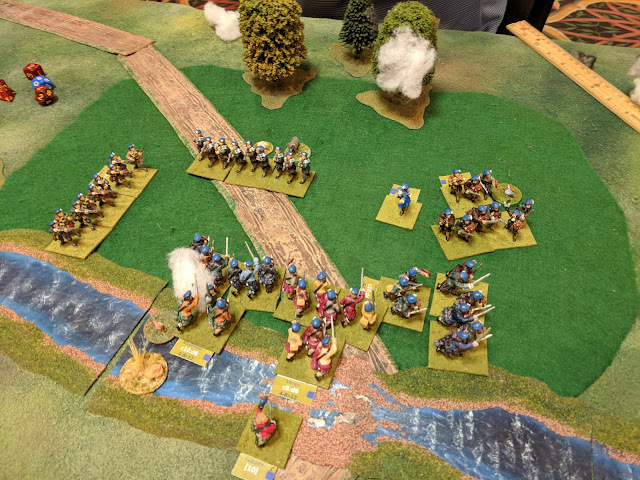 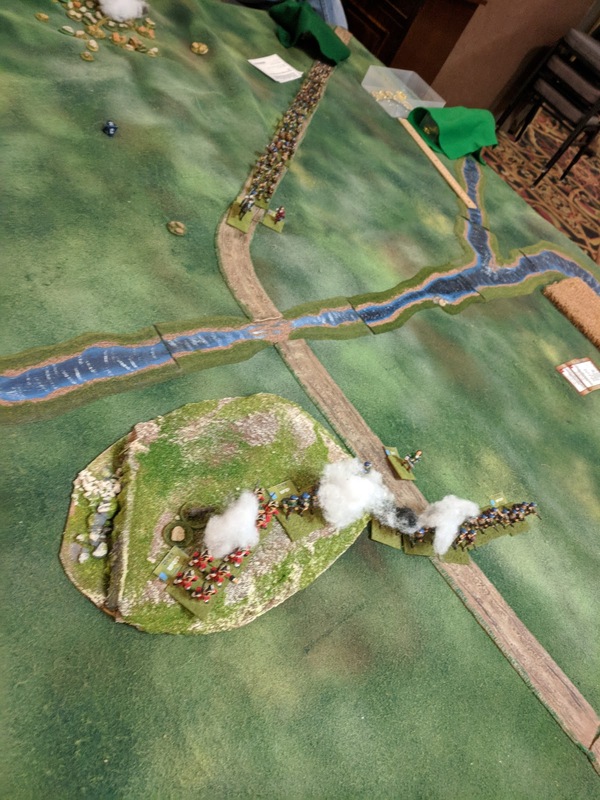 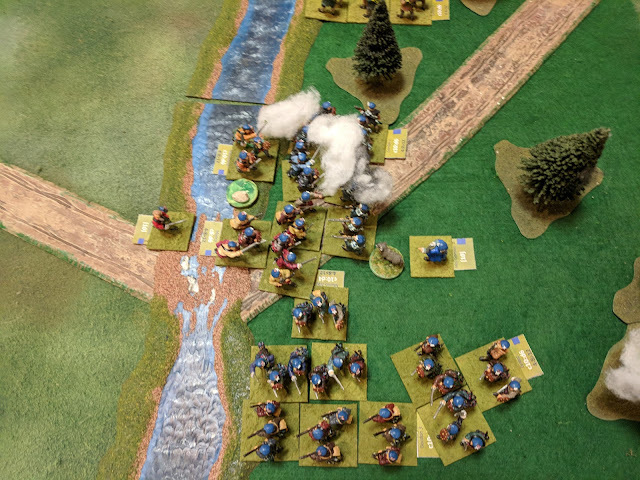 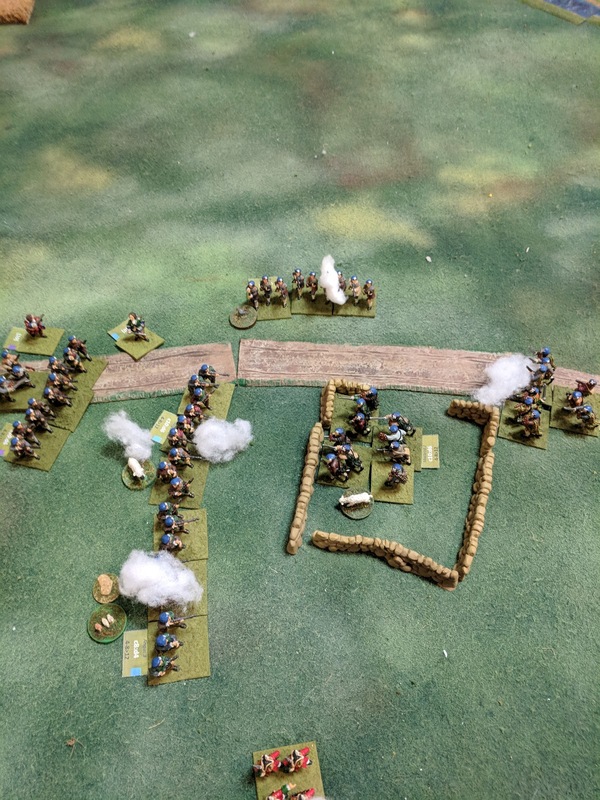 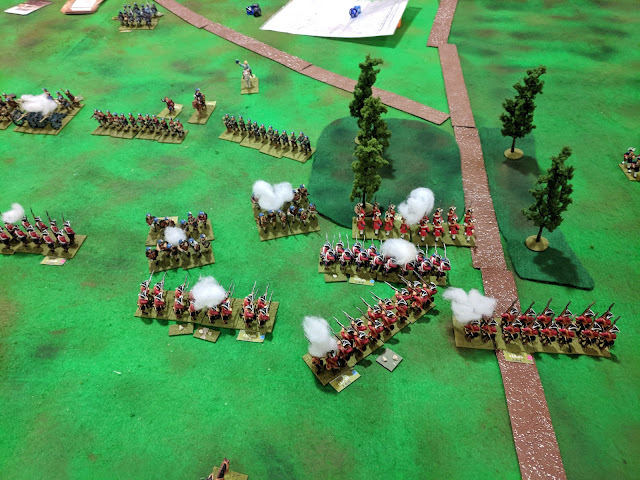 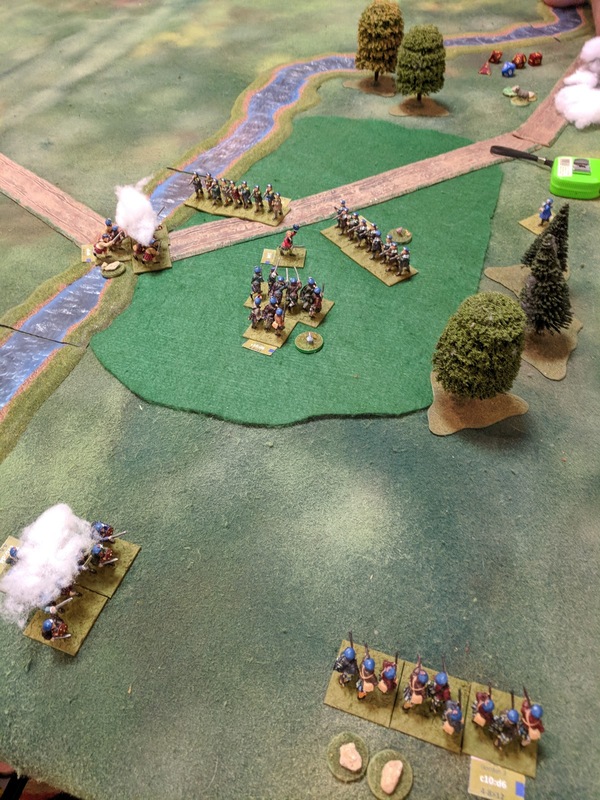 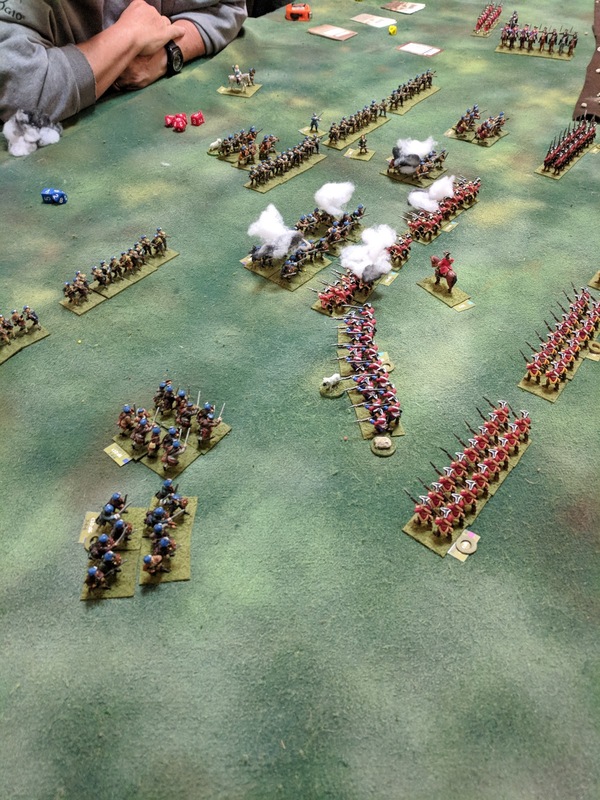 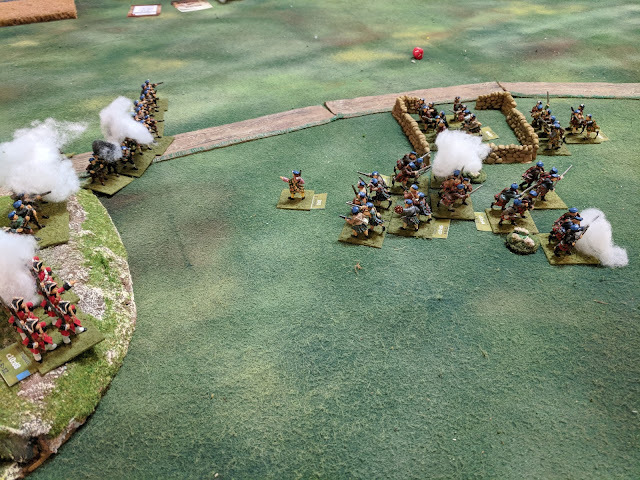 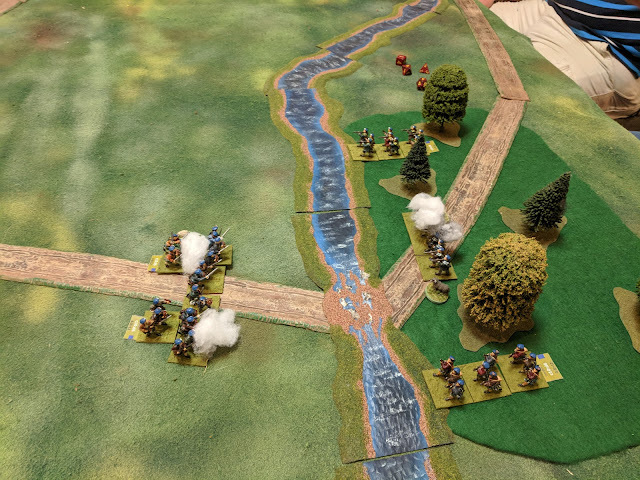 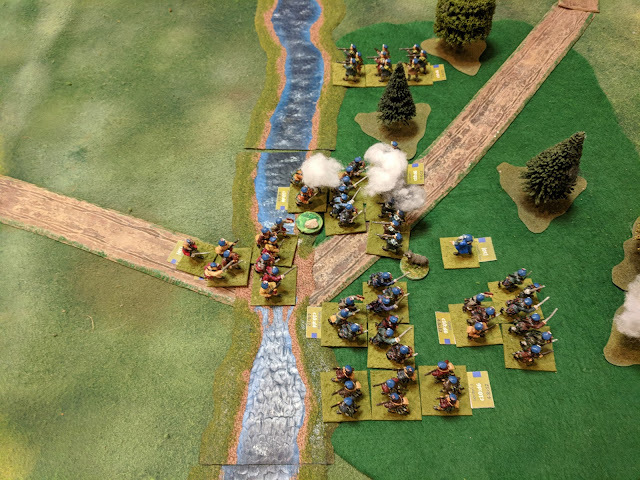 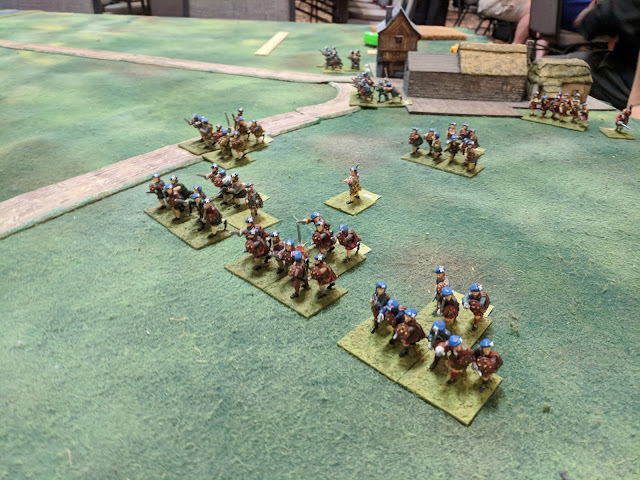 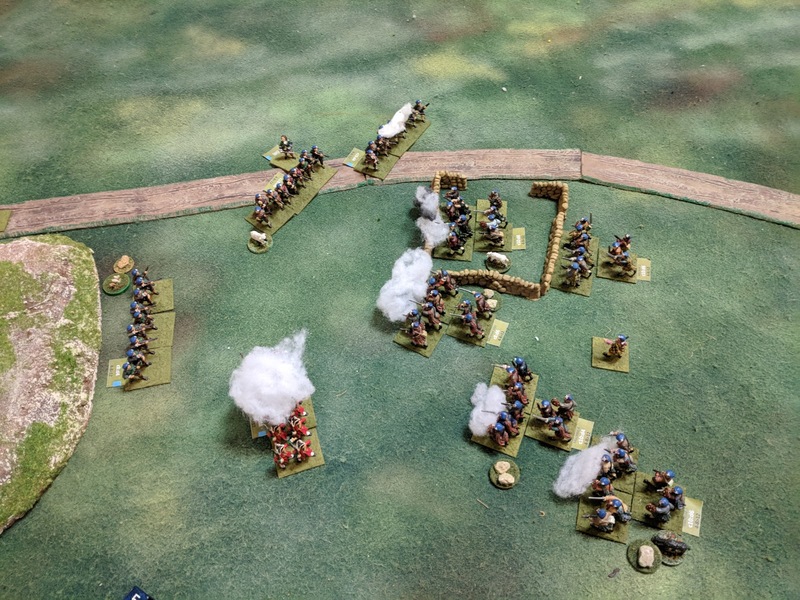 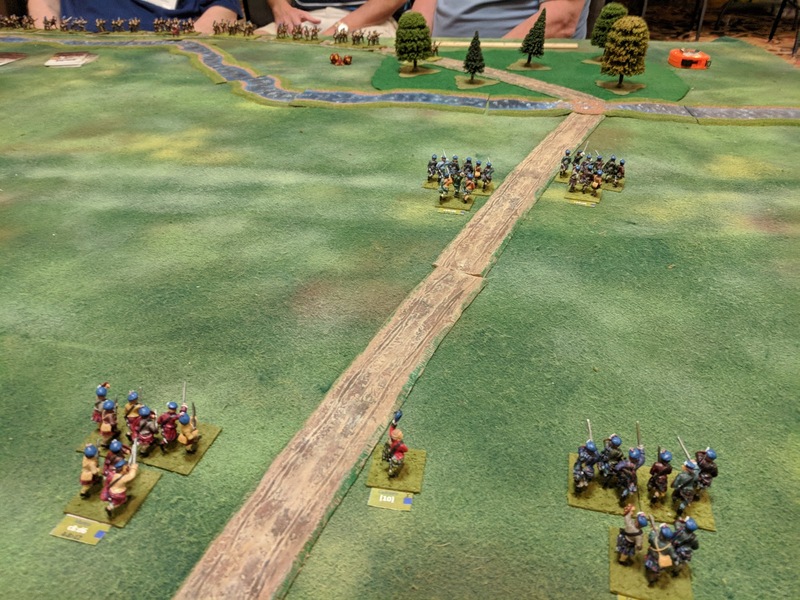 The Piquets and Angus forces press again ..
the Highlander's Army Morale Points were at zero, and the command soon failed an Army Morale test, so they dispersed, leaving the Jacobites victorious, as in the actual battle. A typically exciting game throughout, as highlighted by a quote from Erik (who was in command of the reluctant Inverurie Militia): "I never fired a shot but I had the most fun I ever had playing a game!"